Natalia de Molina is just one of many stars in Berlin, Germany, for the 65th Berlinale International Film Festival, where she took to the red carpet twice on Sunday (February 8) and Monday (February 9). Shooting Stars Photocall: Natalie’s Oscar de la Renta Resort 2015 look is like a spring garden party in a dress. Who amongst you isn’t captivated by the floral blooms that enliven this sumptuous fit-and-flare blue frock? We have long been in the knowledge that when it comes to footwear the Spanish actress never disappoints, so I was delighted that trend didn’t end as she selected a pair of yellow Ursula Mascaró pumps. You may remember that Camilla Belle wore this same dress back in 2013. ‘As We Are Dreaming’ Premiere: The following day the beautiful actress was back on the red carpet wearing a red halter gown that was custom made for her by Spanish designer Lorenzo Caprile. Fitted to perfection, I dare not have any qualms about her look, especially when styled so effortlessly with a gold Salvatore Ferragamo clutch and Tesiro jewels, but I do. I wish her hair had been worn up on this occasion. Perhaps it was because the same is the same from the day before, but the hair says daytime while the gown screams after dark, which has me at odds. 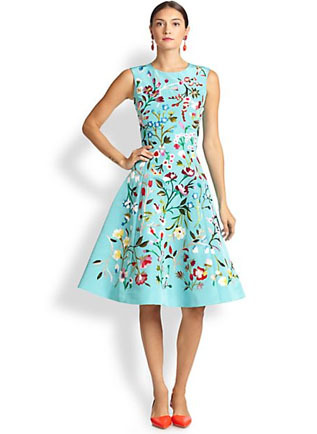 You can buy Natalia’s Oscar de la Renta Embroidered-Floral A-Line Dress from Saks.com.